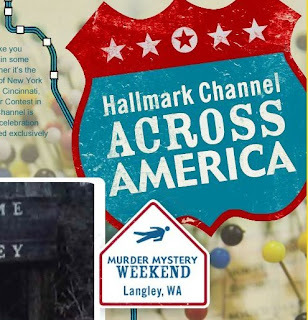 Here's the pilot I produced and directed for the original online series HALLMARK ACROSS AMERICA. This premiere episode focuses on MURDER MYSTERY WEEKEND. Stun Creative hired me for this great gig. It's been a long time since I had this much fun on a project. We were in the beautiful town of Langley, Washington. The town is about an hour north of Seattle on Whidbey Island. The people were really nice and everyone was very cool with us shooting there. I had no idea what to expect going into this... It's always harder to try and find the story as it unfolds rather that just covering a simple event or competition. What I mean is that there were multiple narratives to this event - the story being amateur sleuths trying to figure out "who did it". There are a ton of stories happening all at the same time because there were thousands of people in town, all trying to figure out who the murderer was over two days... We needed to find interesting characters to follow within a few hours of shooting or we had no story. Other festivals, such as Alaska's ice sculpture competition, doesn't really have an unpredictable narrative. You know it is going to be teams of people carving ice all in a confined area. All you need to do was document a few teams carving ice and you were good to go. It was important to Hallmark not only cover the event, but reveal the personalities of the people participating. I agreed totally with this. Getting into personalities is always more fun. Luckily there were a ton of great characters who came to Langley and we got a ton of video gold. We were all over the town, running from team to team, trying to follow their stories... I think this series can be a real winner. Please check it out by clicking the link below and let me know your thoughts!